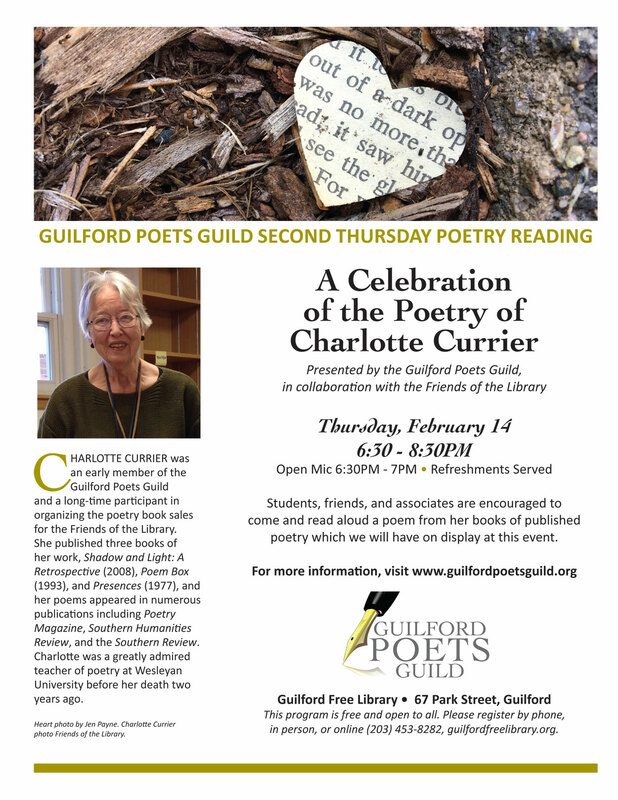 The Guilford Poets Guild, in collaboration with the Friends of the Library, presents A Celebration of the Poetry of Charlotte Currier. 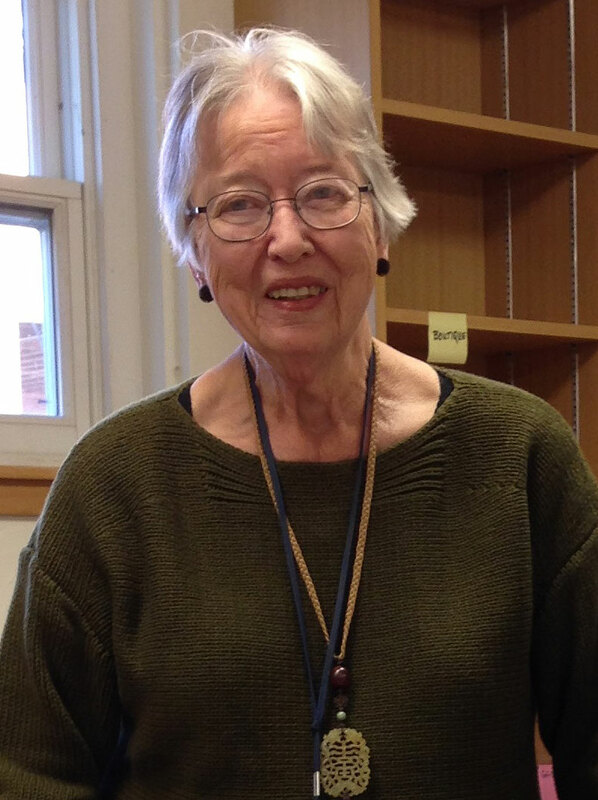 This special Valentine’s Day Second Thursday poetry reading will be held on Thursday, February 14 at the Guilford Free Library, from 6:30 – 8:30 p.m.
Charlotte Currier was an early member of the Guilford Poets Guild and a long-time participant in organizing the poetry book sales for the Friends of the Library. She published three books of her work, Shadow and Light: A Retrospective (2008), Poem Box (1993) and Presences (1977), and her poems appeared in numerous publications including Poetry Magazine, Southern Humanities Review, and the Southern Review. Charlotte was a greatly admired teacher of poetry at Wesleyan University before her death two years ago. Students, friends, and associates are encouraged to come and read aloud a poem from her books of published poetry which we will have on display at this event. The Guilford Poets Guild is pleased to announce photographer Carin Roaldset as the winner of our 20th Anniversary Anthology Cover Contest. 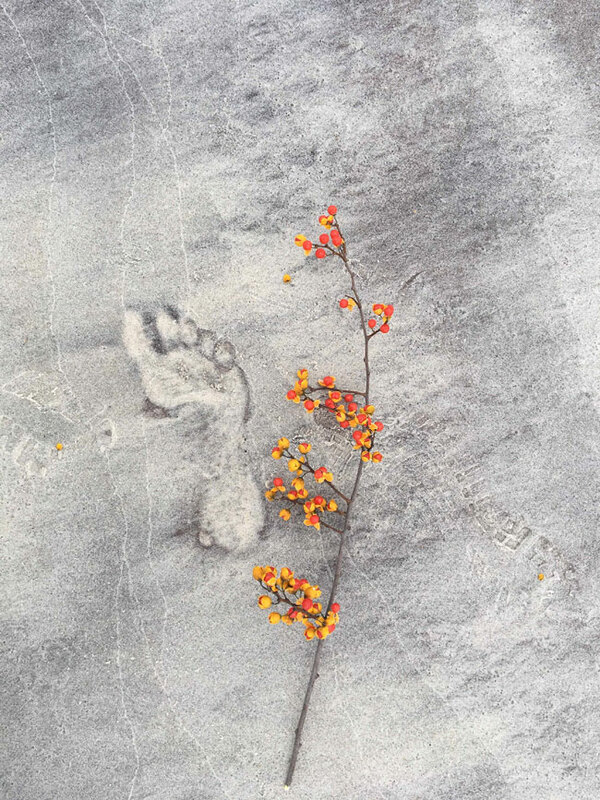 Carin’s photo Footprint, pictured above, was a favorite among Anthology Committee members. Many of you might know Carin from her work on such books as A Measure of Joy – Opening to the Energy of Reiki by Gay Stinnett, Letters from Cornfield Point by Sally Ann D’Aquila, and Here After by poet Mary Volk. Carin belongs to the CT Valley Camera Club and the Essex Art Association. Her art has been displayed in a number of juried shows and she had several solo and group exhibits on the Shoreline. She lives in Old Saybrook with her husband Stein. The GPG’s 20th Anniversary Anthology will be published later this year. Watch for details coming soon! IMAGE: Footprint, ©2018, Carin Roaldset, Rocky Neck State Park, East Lyme, Connecticut, November 24, 2018. Please join the Guilford Poets Guild for its annual Holiday Round Table Poetry Reading on Thursday, December 13. 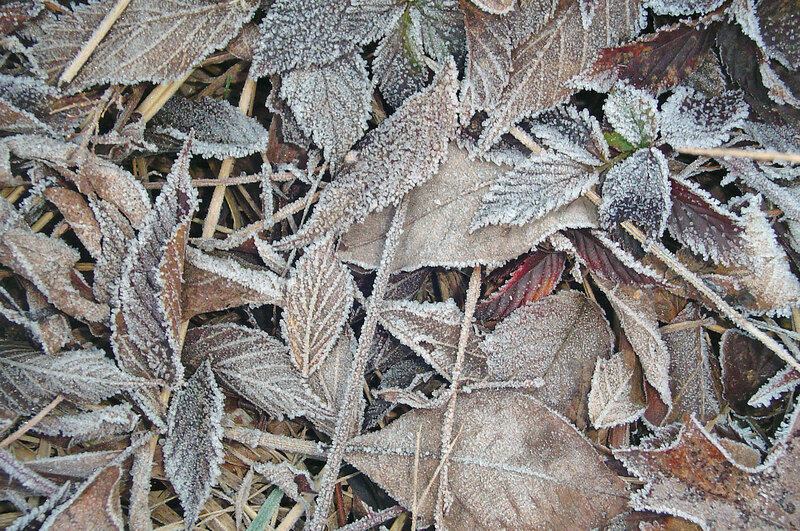 Members of the Guild will read poems around the theme of “The Seasons – Fall Into Winter.” The evening, presented by the Guild and the Guilford Free Library, will be held from 6:30 – 8:30 p.m. at the library. It begins with an Open Mic from 6:30 – 7:00 p.m. Guests are asked to bring an unwrapped children’s book, new or gently used, to be donated to the Branford Community Dining Room. 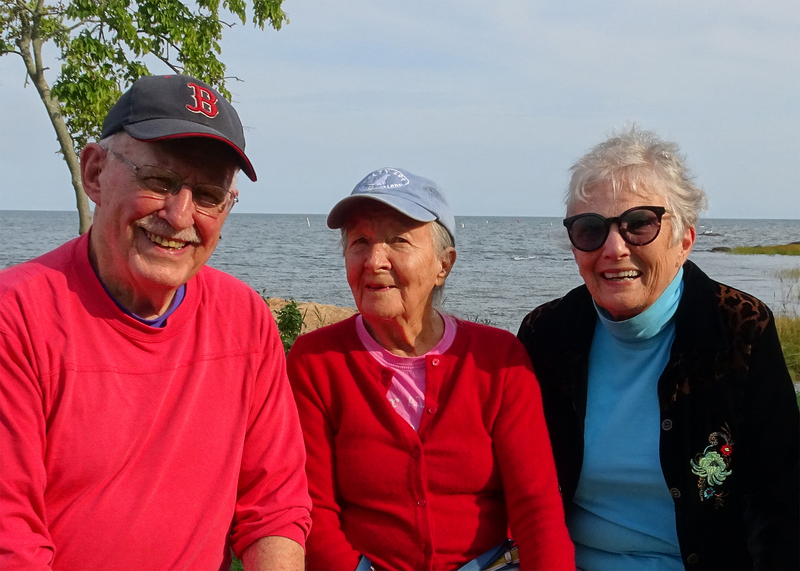 The Guilford Poets Guild is a group of shoreline poets who meet regularly to share poems and promote appreciation of poetry in the community. Its current members are Carol Altieri, Evelyn Atreya, David Cundy, Gwen Gunn, Juliana Harris, Margaret Iacobellis, Karen Gronback Johnson, Norman Marshall, Nancy F. Meneely, Jane Muir, Patricia H. O’Brien, Sharon Olson, Jen Payne, Elizabeth Possidente, Jane Ulrich, Edward Walker, and Gordy Whiteman. 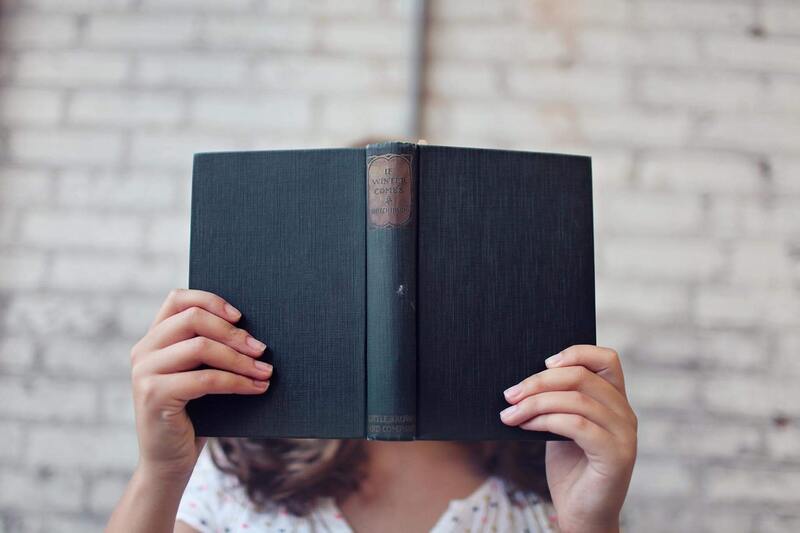 Please join the Guilford Poets Guild for a special reading by three of its members: Juliana Harris, Jane Muir, and Guilford Poet Laureate Gordy Whiteman. This special Second Thursday Poetry Series reading will be held on Thursday, November 8 from 6:30 – 8:30 p.m. at the Guilford Free Library. Juliana Harris has contributed poetry to The New York Times, The Mid-America Poetry Review, The Best Times, Chicken Soup for the Soul and The Kansas City Star, among other publications. A native of Kansas City, Missouri, she has lived in Guilford since 1979 where she is a member of the Guilford Poets Guild. She has recently published a collection of her poems entitled Portraits. She is the author of two novels and is currently at work on her first mystery. Poet Jane Muir says, “I was born six weeks before the Great Depression. It’s been all uphill since then, financially at least. I’ve seen the world change immensely. In my childhood, whenever a plane flew overhead the whole family would run outside to see it. Now astronauts have been to the moon. I graduated from what was then Connecticut College for Women; now it’s co-ed. I worked in publishing and advertising in New York City and after marriage was, as most women in those days, a stay-at-home mom. Don’t think that wasn’t work! Then I went to work at a local paper, a job I really loved. I moved to Guilford in the mid-nineties, took courses in poetry at Southern Connecticut State University, and joined the Guilford Poets Guild, where currently I’m the oldest member. In age, that is.” Muir’s new book, Bulletin from Suburbia, is due out before Christmas. 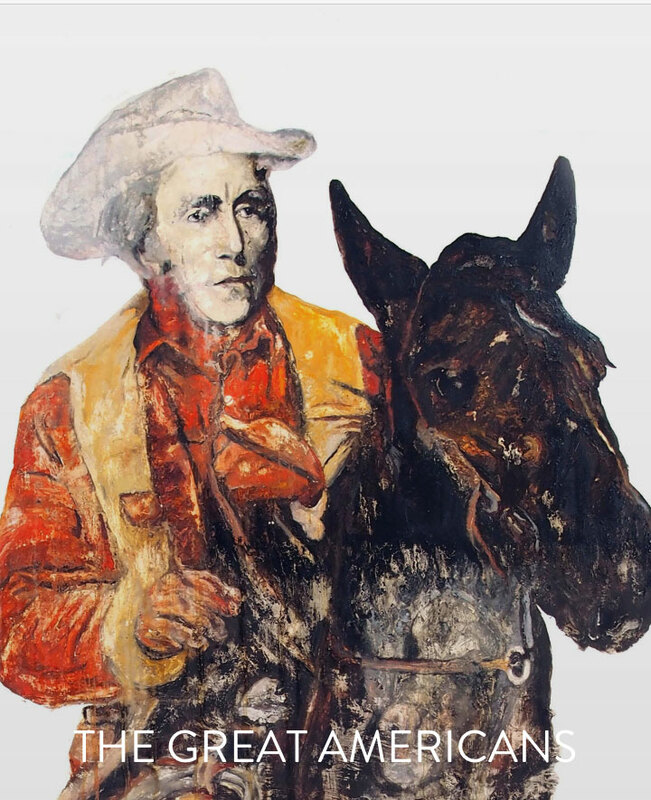 Gordy Whiteman was born to Guilford in 1929. He is a member of the Guilford Poets Guild and serves as its co-president with Jane Muir. He is the author of Whitfield Crossing, and Home Town Guilford. Whiteman is a founding member of the Connecticut Coalition of Poets Laureate and serves as Guilford’s first Poet Laureate. The Guild’s Holiday Roundtable featuring Dr. Seuss poems is scheduled for Thursday, December 13. For more information, visit guilfordpoetsguild.org.